Our Morocco North to South Tour (Fes, Chefchaouen, Tangier, Rabat, Oualidia, Essaouira, Marrakech) takes you high into the northern Rif Mountains, to Tangier where the Atlantic meets the Mediterranean, and on a journey down the Atlantic coast to Marrakech. Truly experience the wonderful diversity of Morocco, and sample the specialities of both the North and South of Morocco. This tour is perfect for the warmer summer months (June-Sept), and for those with a love of the sea and looking to explore a less well known Morocco. Our Morocco North to South Tour can be modified from 5-12 days or more depending on your time and what you would like to see. A similar tour can also start in Marrakech and end in Fes. After breakfast explore Fes, the most ancient and holy of the Imperial cities. Your cultural and historic tour will take you through the 2000 year old living medina; a labyrinth of narrow lanes alive with markets and souks, craftsmen, donkeys and mules transporting their loads. Visit the Attarine and Bou Anania Medersas (Islamic universities), the Nejjarine fountain, the Moulay Idriss Mausoleum, and the Karaouine Mosque. Finish your tour with a visit to Fes Jdid, and the revered Merenid Tombs for a spectacular panoramic view of Fes. Overnight in Fes. Depart Fes for Chefchaouen. A scenic drive will take you through fertile agricultural land to high in the Rif Mountains. Chefchaouen is famous for its vivid blue rinsed houses and is very popular for both tourists and Moroccans, particularly in the hot summer months. Overnight in Chefchaouen. Spend the day exploring Chefchaouen. Winding lanes and narrow alleys are home to numerous souks offering cuisine and artisan works, such as woollen items, intricate embroidery, and goats cheese; all native to the North and not found anywhere else in Morocco. Relax in the square, visit a local farm or hike in nearby parks. Overnight in Chefchaouen. Depart Chefchaouen for the city of Tangier via the green valleys of the Rif Mountains. Tangier, the gateway to Africa from Europe, has always been an international melting pot. Take a tour of Tangier and explore the bustling medina, and city surrounds, and enjoy the stunning vista where the Mediterranean and Atlantic meet. Overnight in Tangier. 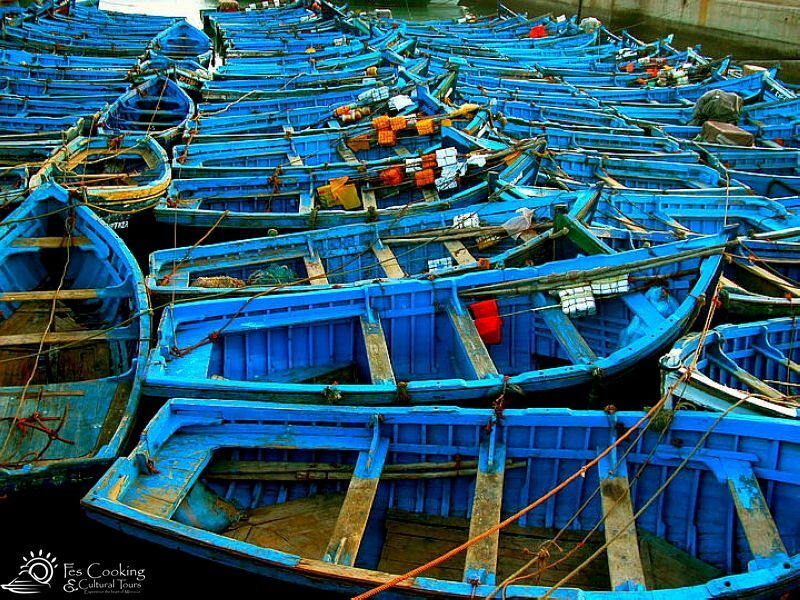 Depart from Tangier on the stunning coast road to Rabat via Asilah, a beautiful coastal town with its whitewashed houses, blue walls and doors, and many murals. Explore the Imperial City of Rabat, including the Mechouar (the ramparts and walls surrounding the Royal Palace), the majestic Mohammed V Mausoleum, the Hassan Tower and the Oudaya Kasbah, overlooking the Atlantic Ocean and offering fabulous views, as well as being home to Moroccan artisan galleries. Overnight in Rabat. Depart Rabat and travel along the Atlantic coast. Stop in Casablanca to visit the central market, Habous district, Mohammed V square and the impressive mosque of Hassan II. Continue to El Jadida, a small port city, formerly controlled by the Portuguese which is now a UNESCO World Heritage site. Arrive and relax in Oualidia, a small seaside village with a protected lagoon, estuary, and wild Atlantic Ocean all right on your doorstep. Walking, birdwatching (Oualidia is at the centre of Morocco’s richest bird habitat, particularly in Spring and Autumn), fishing, swimming, kayaking, kite surfing and surfing are just some of the activities you can enjoy in Oualidia. Overnight in Oualidia. Depart Oualidia and continue to Essaouira. Stop in Safi, also a previously Portuguese occupied town. Famous as being the centre of sardine exports, Safi is perhaps most well known for its pottery and there is much to explore here. Continue to Essaouira, a UNESCO World Heritage listed city. This windswept fishing port, with broad beaches and ancient walled medina with ramparts built into the cliffs has long been a popular destination. With its relaxed feel, take in the small but bustling medina, stroll along the ramparts or beach, or visit the port to see the daily catch. The Gnaouas Music Festival is held in Essaouira in June. Overnight in Essaouira. Depart Essaouira for Marrakech. A relaxing drive lined with argan oil cooperatives will take you to Marrakech. Overnight in Marrakech. Explore the famous city of Marrakech, the ‘southern pearl’ of Morocco, and second oldest Imperial city which has for centuries been an important stop for traders and travellers. Your tour will include the Menera Gardens, the famous Jardin Majoralle, the Bahia Palace and the Saadian tombs. Visit the Koutoubia Mosque, with its 77 metre high minaret dominating the centre of Marrakech. Continue to one of the centre attractions of Marrakech; Djemaa el-Fna, the famous UNESCO World Heritage Site which is one of the main cultural spaces in Marrakech. Relax at one of the many cafes surrounding the square to take in all the sights. Continue on and explore the varied and colourful souks. Complete your memories of Marrakech with the Fantasia Moroccan dinner and cultural show. Taking place in the heart of a palm grove, you will dine in caidal tents, and be entertained by musicians, dancers and amazing horsemanship. Overnight in Marrakech.